We collect our clients from all hotels, guesthouses and private homes in Gauteng as well as from Johannesburg Airport. We travel via the Highveld farmlands to the picturesque subtropical Lowveld and on to Tremisana Game Lodge in the Balule Section of the Kruger Park. After a short break during which you may unwind at the bar, have a swim or relax in the tropical gardens, we board the open Landcruiser for a 3h Sunset Drive. Your guide will show you various animals and birds and after dark, use spotlights to locate nocturnal species. Dinner will be a BUSH BRAAI in our Marula Tree Boma deep in the African bush. 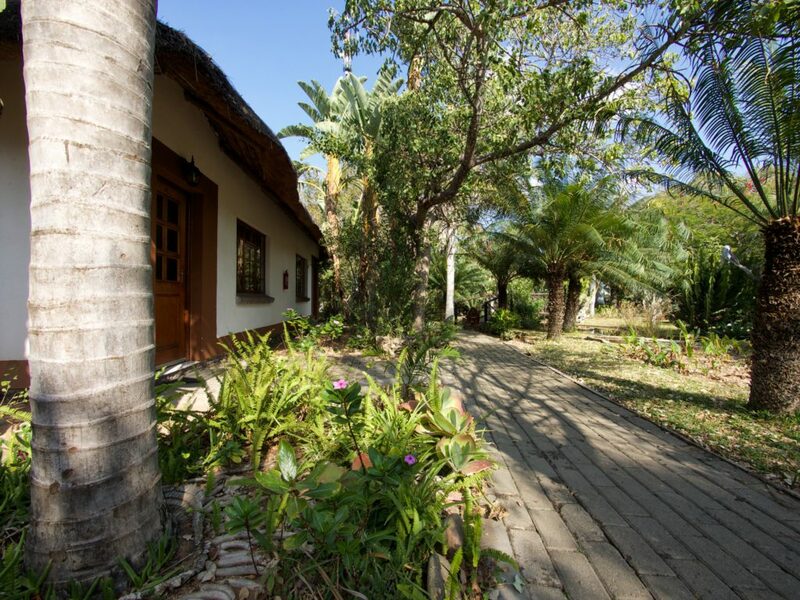 Overnight in comfortable air-conditioned en suite thatch-roofed chalets. Awaken at sunrise for an exhilarating day of unforgettable bush life. Drive to a remote venue, where you enjoy a 4h “ walk in the wild ”. Your experienced field guides will lead you through the bush at a pace you can handle in search of the Big Five. The thrill of following Africa’s large animals until you are close enough to take a decent photo will remain with you forever. Adrenalin surges will be acute, notwithstanding the fact that your rangers are adequately armed in case of danger. Return to Tremisana for brunch. Later you may sleep in your air conditioned chalet or swim in the pool. Our Lapa has extensive wildlife magazines. Visit the game viewing Hide overlooking Tremisana Dam.A light lunch will be served and at around 15h30 we go on a 4 h game drive on Balule Big 5 Game Reserve. On the game drive your rangers will be in radio contact so as to keep us informed of the movements of the game. We stop for Sundowners at a magnificent location and toast the splendour of Africa. Return to Tremisana at around 19h30. We travel to the Orpen Gate of Kruger Park where we board our open Gameviewer. The absence of windows and the elevated vantage position allow for excellent photographic opportunities. You will have an amazing chance not only to view game but also to listen to and smell the African bush and its denizens. There will be regular stops at picnic spots, rest camps and places of interest. Your experienced ranger will show you many animals and birds that frequent this wildlife paradise. The Orpen-Satara-Nwanedzi regions boast open plains and support large herds of zebra, giraffe and antelope that attract numerous predators. In fact the zones we visit have the highest concentration of lions in Africa ! Enjoy an early morning Sunrise Drive on the Open Landcruiser. After a hearty breakfast, there will be time to purchase some memorabilia from our shop and take your last photos of the luxuriant lush gardens at Tremisana. We then drive to the awesome Three Rondawels and the Blyde River Canyon. Return to Gauteng in the late afternoon. Airport drop off by arrangement.